I listened to this book on audio tape since I had a time constraint in order to read it in time for a book club. At first, it was difficult for me to hear about the difficulties Harry Whitney faces with the early-stages of Alzheimer's Disease since I know this disease quite well as my grandfather suffered with it. So, some of the explanations of A.D. didn't make sense to me from what I'd remembered about my grandfather. I felt Harry's medical issues were never fully disclosed in the book. It was confusing but I'm not sure how knowing more about Harry's disease would have been significant to the story. Since Harry is dying, he goes in and out of his disease having episodes of "good" time where he can write down significant things that he wishes to tell his family through letters he wrote to his grand-daughter, Emily. 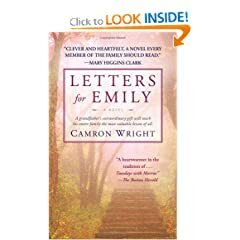 As the family starts reading his letters to Emily, they discover that they are full of hidden messages. This is the part of the story where I wondered if it would be easier to read the book than to have listened to it on audio. In poems, Harry wrote clues and riddles which lead to more letters on the computer and eventually to a safe, perhaps, filled with some sort of treasure. As the adults start helping Emily decipher the poems, I felt that poor little Emily was forgotten. Her character had been significant in the beginning and then dwindled. All of the letters still started with "Dear Emily" so that didn't make sense to me. I wanted to know more of Emily's feelings and reaction to what was happening with all of the discoveries. In the end, it wrapped up too neatly. Some of the side characters who were introduced were never explained what happened to them and some problems seemed to take care of themselves. I liked the premise that the author was trying to convey, a dying man wishes to leave a legacy to his grand-daughter, but so much was lost overall that could have easily been explained. Some of the messages brought in through the letters were nice but general life lessons. In some ways, it was a clever book but I think it could have been so much more. I haven't read many books dealing with Alzheimers, but I remember some short stories I read awhile back and they didn't strike me as genuine. Neither did The Notebook by Nicholas Sparks that I read earlier this year. I don't know if that's because my exposure to Alzheimers is very limited, or because the one person I knew with it had other diseases that changed it from the norm, but I wonder if Alzheimers is just one thing that's difficult to get across in written form. has your book club discussed it yet? i think you're right - if one has to decipher clues from Harry's letters, a book is much more useful than an audio-tape. so i'd be interested in knowing what the rest of the book club thought of LFE. Amanda - That may be true that Alzheimer's might be one of those things that is hard to put down in written for me. It is hard for me to write about my grandfather, for instance. I have heard that a book called Still Alice by Lisa Genova that also deals with early onset A.D. and it has some great reviews on Amazon. I'd like to put that on my TBR list.